I lived quite a sizeable part of my early life in British India not in independent India. And I was born in Kerala, but I am in a sense, I have a double India. I am a Tamilian who grew up in Kerala. My father came from a place called Palghat, which is nowadays fairly famous for a whole line of musicians and scientists who have come from there. And my mother came from Travancore and her background they were a family of landowners. Though I know very little about their other background and I was a late child. So I think very soon after I was born, hardly 5 years, my father had retired from service. He was in the Revenue Department and he used to travel around the place and probably survey land and make maps and things of that kind. So early in life I was quite sickly. So when I was school-worthy I didn’t go to school. So we had a tutor come to our house and teach me the basics of language, the alphabet to start with. And then I seemed to have picked that up fairly easily and he was a very fine man. In fact I still remember that my grandmother used to tell, ‘You’re no good as a teacher unless you break a cane or two on his backside. How will he learn anything at all?’ Well I didn’t give him any need to do that and he also did quite well. And I heard that when I got the Kalidas Samman calendar, somewhere he had read it in the papers and he was very happy that he once taught me the alphabet. From the beginning, all three? All three, yes. We had a primary school round the corner of our house but then I could never go and sit there. I had some trouble or the other. In fact I went to school only after I was 10 or 11 and went straight into what was called in those days I think the Fourth Standard or something. Those days the school system had, I think, six standards and four forms, so made 10. And finally you took the matriculation examination. 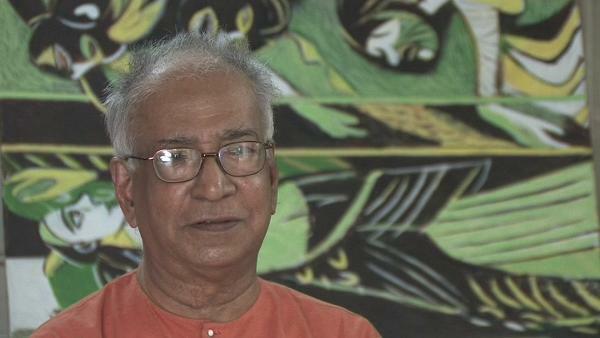 KG Subramanyan (1924-2016) was an Indian artist. A graduate of the renowned art college of Kala Bhavana in Santiniketan, Subramanyan was both a theoretician and an art historian whose writings formed the basis for the study of contemporary Indian art. His own work, which broke down the barrier between artist and artisan, was executed in a wide range of media and drew upon myth and tradition for its inspiration. Timothy Hyman is a graduate of Slade School of Fine Art, London, in which he has also taught. In 1980 and 1982, he was Visiting Professor in Baroda, India. Timothy Hyman has curated many significant art exhibitions and has published articles and monographs on both European and Indian artists.